The Mona Shores boys tennis team finished third on Thursday in a quad at Grand Haven. The Mona Shores boys’ tennis team kicked off its season with a solid showing at the Grandville Open on Friday. The North Muskegon girls tennis team took part in the Division 4 regional at Grand Rapids Northpointe Christian on Thursday. The North Muskegon girls tennis team won the Coastal Conference tournament last weekend, besting second-place Ludington by five points. MUSKEGON – Winning city tennis championships had become a habit for North Muskegon’s Brittany Bailey. Spring Lake’s girls tennis teams started its season with a second place finish at the Zeeland East Indoor Invitational on Saturday. The North Muskegon girls tennis team captured the Portland Invitational at Michigan State University’s indoor courts on Saturday while Whitehall finished third. The Whitehall Vikings have been working their way into the elite circles of Michigan high school boy’s tennis for several years now. The Mona Shores tennis team finished second in the O-K Black Conference tournament on Monday. MUSKEGON TOWNSHIP – North Muskegon’s Bobby Tarrant obviously wanted a third individual city tennis championship very badly. The Mona Shores tennis team defeated Grand Rapids Union 7-1 on Tuesday in O-K Black Conference action. The Mona Shores tennis team defeated Ludington 6-2 and lost to Grand Rapids Catholic Central 6-2 in a Thursday meet on their home courts. The Reeths-Puffer boys tennis squad defeated Lowell 6-2 on Thursday night. The Mona Shores boy’s tennis team took first place in its own three-team event on Thursday evening. 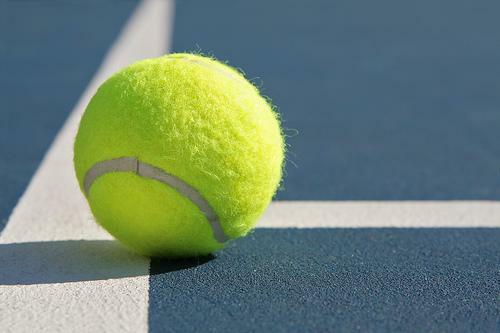 Four local teams took part in the girls tennis state finals this weekend and North Muskegon held the top finish.